only Black-Tailed Prairie Dog colonies in Canada. Black-tailed Prairie Dogs, Cynomys ludovicianus, in Dog Town along the Frenchman River Valley Ecotour Route in the West Block of Grasslands National Park, Saskatchewan, Canada. 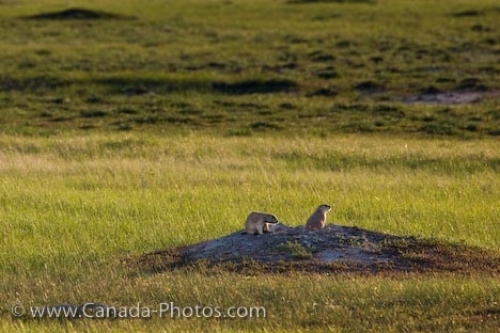 Black-tailed prairie dogs along the Frenchman River Valley, west block of Grasslands National Park, Saskatchewan.